LTM off to a flying start at Tarbert Castle! Managing director Steven Laing gives a talk about the project. 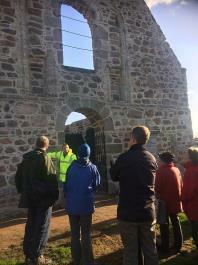 An event was held on Friday 10th November to mark the completion of an extensive scheme of repairs to the historic Kincardine O'Neil Auld Kirk funded by Aberdeenshire Council’s Historic Asset Management Project (HAMP). The historic importance of the kirk is recognised nationally by its designation as a Scheduled Ancient Monument. People were invited to meet at the village hall to hear a presentation from HAMP Project Officer Frances Swanston on the background to the HAMP Project, the history of the kirk and an outline of the repair works undertaken. This was followed by Steven Laing, Director of Laing Traditional Masonry Group, talking in detail about the repair work carried out, and continued with a walking tour around the kirk. The Historic Asset Management Project was established in 2013, set up specifically to identify non-operational historic assets in Council ownership. Over 500 historic assets were identified ranging from ruined churches, war memorials, fountains, mausoleums, market crosses etc. These assets were then surveyed and repair work was prioritise on a health and safety basis. The survey of Kincardine O’Neil Auld kirk identified issues with the cement mortar used to repair the kirk in the past. The cement was failing in places with stones falling off the kirk. The mortar was missing in a lot of areas leading to the deterioration of the stone and therefore the structure. The walls of the kirk were found to be hollow in places caused my many years or rain penetrating into the walls and washing out the core. The repair works ran from April to September. The LTM Group were appointed through a competitive tender process to remove of all cement mortar from the building and its replacement with a lime based mortar. The voids in the walls were filled and the concrete capping on the tops of the wall was removed and replaced with a lime ‘rough racked’ capping. The kirk looks splendid now the works have been completed and have safeguarded this significant monument for the next generation.